Elections matter. That’s why it is so important for members to be engaged in the political process. Contributing to BUILD-PAC is one of the best ways to be engaged and shape political outcomes. Participation is critical. That’s why BUILD-PAC this year created a new Fair Share level. With a contribution of just $25, far more members can join the fight for housing. BUILD-PAC can accept only personal funds. It is illegal for a political action committee to contribute corporate donations to congressional candidates. For more information, please call the BUILD-PAC staff at 800-368-5242, ext. 8470 or send an email to BUILD-PAC@nahb.org. Additional information is also available at NAHB.org/BUILDPAC. Please help us to reach our BUILD PAC goal in the next 2 weeks by contributing $25-$1000. Any amount from $25 to $1000 will allow us to help save money on New Home Builds. Please let me know if you have any questions. NDAB-PAC is the North Dakota Association of Builders’ Political Action Committee. It is a non-partisan political action committee which provides support for candidates who are friends of the building industry. NDAB-PAC recognizes there is strength in numbers. People who show they care and are concerned about the future of the building industry make contributions to NDAB-PAC because they believe that cooperation equals strength. You alone can’t influence the Legislature or Congress on issues that can devastate your business. NDAB-PAC is your front line of defense. It monitors legislative issues and works to protect and promote the building industry. WHY SHOULD I GIVE TO NDAB-PAC? NDAB-PAC’s ability to defend and promote your business rests squarely on the financial support it receives from you and other members. The contributions will give NDAB-PAC the needed resources and clout to succeed on issues affecting the building industry. Click here to open the NDAB-PAC donation form. HOW DOES NDAB-PAC HELP YOU? By pooling contributions from NDAB members, NDAB-PAC is able to help elect legislators who understand and support the issues and concerns of builders and associate members. You can also choose to contribute to BUILD-PAC, the National Association of Home Builders’ Political Action Committee, one of the most recognized and well-respected PACs in Washington. 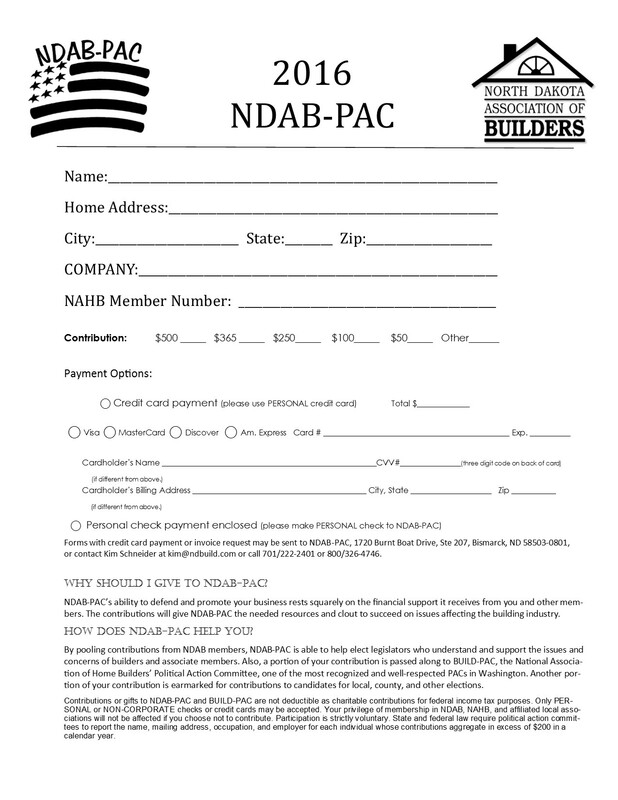 Simply, ask your local association office, or NDAB, for the BUILD-PAC donation form. Thank you!